Is There A Water Shortage In Paso Robles? This is just food for thought and by no means am I an expert on the water situation here on the California Central Coast … just someone who makes extremely unique wine barrels but now finds himself as a concerned citizen who would like to see all the information laid out on the table. As almost any Californian can tell you, we are in a severe drought. In a two-year period in Paso Robles, we’ve had about five inches of rain and over the last year, it’s less than two inches. Heck, the way the news talks about it nationally, I’d be surprised if not most of the country and even the world knows we have had a lack of rain in the Golden State for the past couple of years. This is of a major concern for the folks in the North County area of San Luis Obispo County, sometimes generalized as Paso Robles. Recently named the world’s ‘Wine Region of the Year‘, Paso Robles – or Paso for short – vineyards have become serious business here in wine country. However, like any other farmed product, grapevines need water. With a sudden sense of urgency, near the end of last summer, the San Luis Obispo County Supervisors voted autonomously for what was essentially a two-year emergency moratorium on new vines being planted, which some feel was warranted. Technically, a grape-grower can plant new vines but there’s a ’1-to-1′ ruling that states a new vine can only be planted for every one that is taken out of the ground. Now there’s good news in that the value of property will go up because if anyone wants to expand, they will have to buy someone else out. I’m sure those who are in the real estate business are happy as well as those land owners who want out. Still, it affects the industry negatively due to the fact nobody can expand, in-turn stifling business in what was the ever-growing Paso viticultural business. 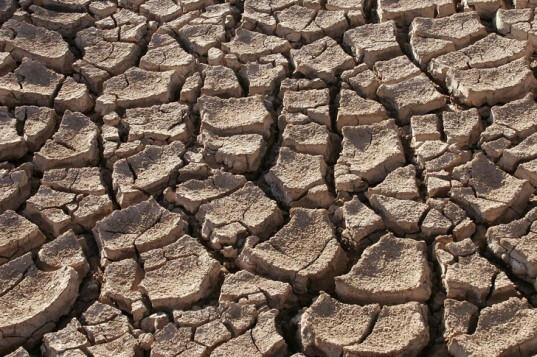 All of this created by the lack of water – or at least the supposed lack of water. See, the Paso Robles water basin is the largest natural underground aquifer west of the Rockies. Yes, we are in a drought and we just came out of another drought just a handful of years ago. The underground reserves are down which might be of some concern. However, why is the county trying to set up a water district with an idea being that they would be a water bank for outside water agencies? 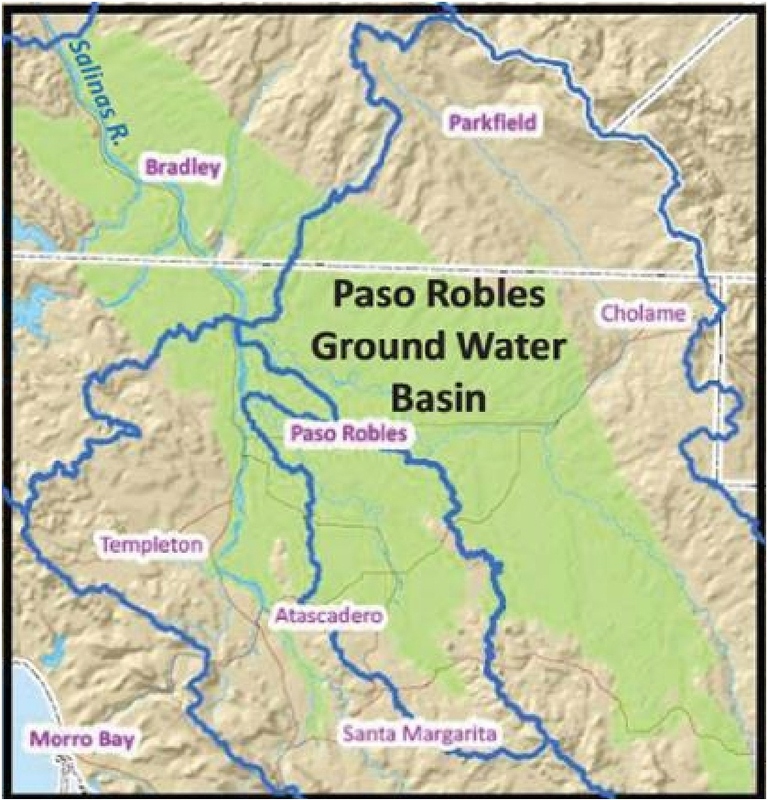 The Paso Robles Ground Water basin running essentially with the Salinas River is the largest underground aquifer in the West. As a citizen who figures that sooner or later the city and county will be restricting our water usage to conserve water so that we don’t run out, will we be selling that same water to other districts desperate for water? There is seemingly a detachment from logic that says if indeed San Luis Obispo County is in need of restricting citizens water usage so that we don’t run out, that we can’t turn around and sell what extra water we do have to some other place in the state. Unless of course, Paso has more water than the political lords are willing to let on. Again, I’m ready for conservation modes and in fact we already have certain restrictions on water use in the city of Paso Robles that says we can only water three times a week and other relatively common sense approaches to water usage like not letting a hose run without a shutoff nozzle. 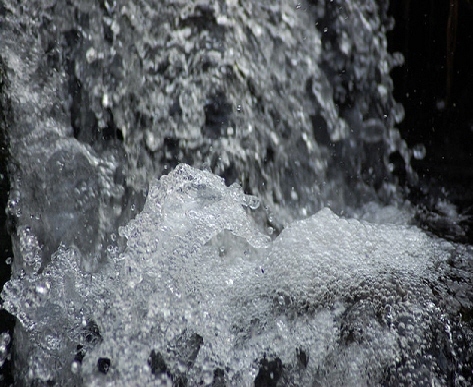 The title question of the story: Is there a water shortage in Paso Robles? – Isn’t being directly answered. Already the San Luis Obispo County Board of Supervisors is undermining land rights by infringing on a property owners’ rights to his or her own water. Further, the city of Paso Robles has stopped any new drilling for water within city limits, even though the land owners have a right to the water below them. Some have fought back and you can go here for more on that (or an additional source: Cal Coast News). How this turns out, I don’t particularly know but at the very least, more information should be made public – yet that doesn’t appear to be the case. Something else to consider is who’s to profit from selling our underground water if indeed it is sold to outsiders? Are some of the power brokers in the county vying for a huge payoff at the expense of local citizens? There are extremely desperate communities in need of water during this drought (see San Jose Mercury News) and they might go to any length to get it. This doesn’t feel right. In a day and age when there’s little or no transparency within federal, state and now local governments, just exactly what is our water situation? I would hope more citizens start clamoring for additional information on just what is happening behind closed doors along with what subversive politicking might be going on. Even then, we may not be getting the truth … but the truth is what we need to pursue. Is there a water shortage in Paso Robles? This entry was posted in Water and tagged California Central Coast, California drought, North County, Paso, Paso Robles, San Luis Obispo County, water bank, wine country on January 29, 2014 by PasoDr. 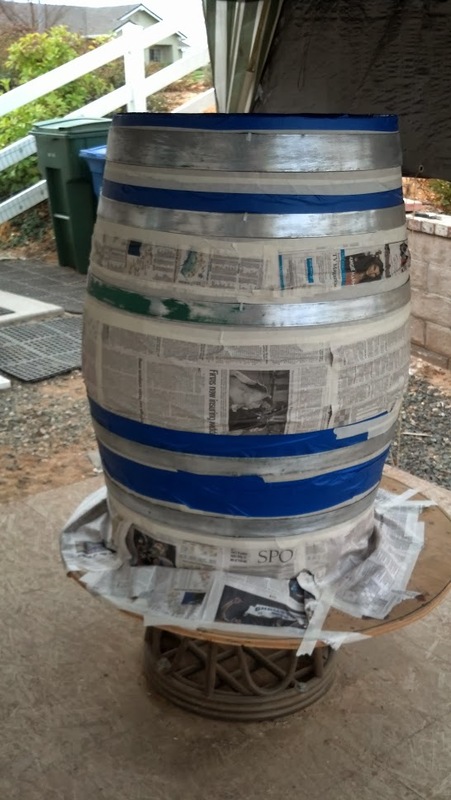 Recrafting An Old Wine Barrel – Painting … And More Painting? Our special project barrel has been a lot of work including the simple sounding prepping – but most everything has gone rather smoothly … until now. More trees were chopped down to aid us in redoing one of the bands after initially painting the entire barrel’s hoops. We may or may not have mentioned it but if you had looked closely at the head bands in the pictures – those hoops that were at the far top and bottom – they weren’t in good shape. We sanded and prepped them for primer and paint but didn’t like the way they came out with one particular hoop. The primer had covered some of the pits and it’s not unusual for paint to take care of any other very minor pits. However, we didn’t like the way it appeared after drying, so we striped it again – we use dark grey primer as seen in the picture. Note: we know that some of these imperfections come with dealing with an old wine barrel and sometimes we let these blemishes go but in this instance, they were pronounced and it was our artistic impression that we should do this one band over again. Regardless, the one band was once again primered, sanded, prepped and then painted one more time. The overall look was better and we were happy with the end result. The barrels owner inspected what we had done and couldn’t wait to get his renewed barrel back. We will buff it out and give it one final cleaning. Looks like one last installment is necessary as we unveil the final product. 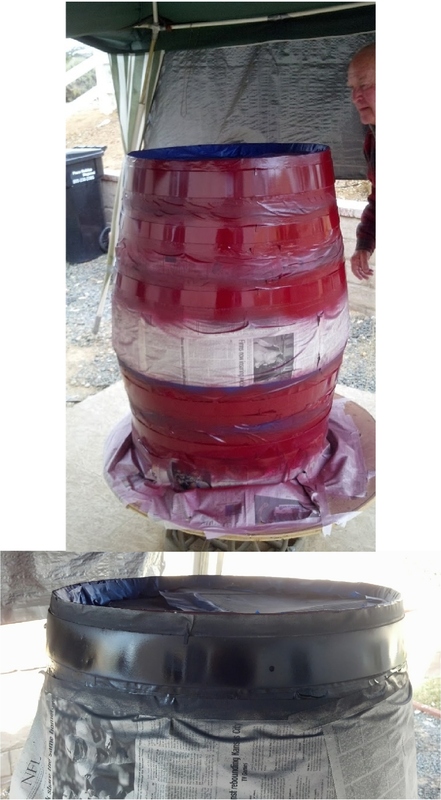 This entry was posted in Barrels + and tagged hoop bands, hoops, old wine barrels, paint prep for wine barrel, primered, reprimered, wine barrel on January 27, 2014 by PasoDr. 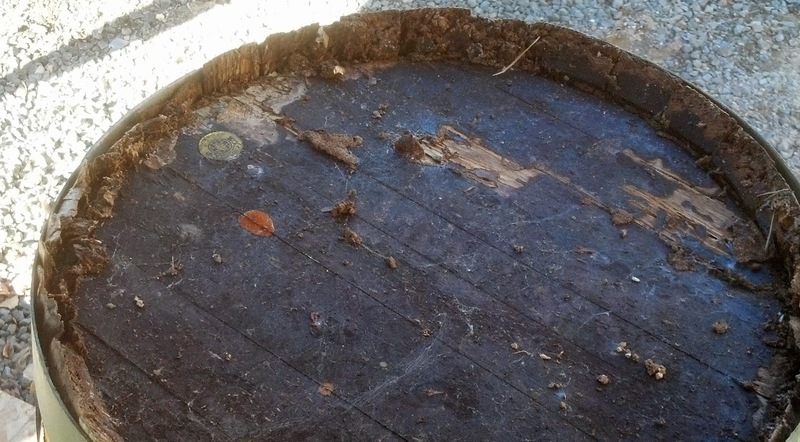 Taking a dilapidated old wine barrel and making it look better than new is a challenge when it has an end of it that is rotten – as we stated when we started this project. Plus the wine barrel had previously been stained and painted which made the work all that more tedious. There are at least two bands left on a barrel at all times while staining and sealing. Now we take the barrel and remove some of the hoops off so we can stain and seal using a darker stain than we normally apply. We call this color leather because it gives the wine barrel the look that it is encased in leather. As we go along, we move some of the hoops (or bands) off and replace them with others to keep the barrel together, waiting between times to let the stain and sealer on the barrel dry. And we should note ever so importantly that we can’t take all the bands off or the barrel would come apart and that isn’t a pretty thing to have happen – think of the funniest comedy scene you’ve ever saw. Yes, we’ve been there and don’t want to do it again. Now that we have the barrel stained, we will need to prep the barrel with the hoop bands on it and ready the bands for paint. Again, we will use burgundy on this one which makes it meld into the barrel for a more subtle look. The owner of the barrel wanted that particular kind of appearance. By the way, go to our poll and give your opinion of what color you think would look the best. The bands are in place and prepped with paper and tape used to keep the band paint off the wood. Having had a classic restoration business, we know all too well how much time and effort goes into prepping, which is one of the most unrewarding jobs to do. We use the county rag (San Luis Obispo Tribune) for cover – it has to be good for something. We will paint next and then let dry before buffing and shining it up a bit. You can see how that goes with what should be our last installment of ‘Recrafting An Old Wine Barrel’. 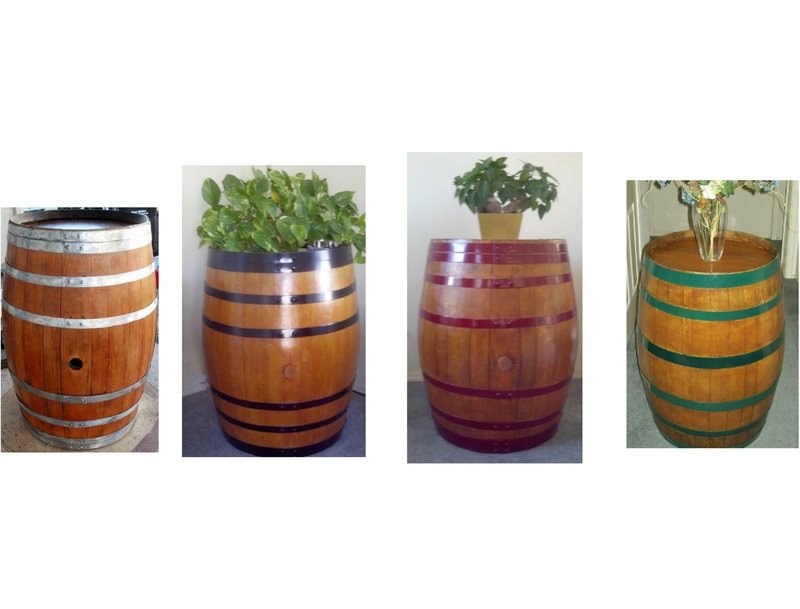 This entry was posted in Barrels + and tagged hoops, old wine barrels, paint prep for wine barrel, staining barrels, staves, wine barrel on January 25, 2014 by PasoDr. When we started this project (go here), one end (or head as it’s called) of the wine barrel was rotten in places due to sitting in mud on and off through the years. It wasn’t repairable beyond placing another piece of wood over it while sanding and grinding most of chime off – the chime is the end of a stave beyond the head. Ron points to the uneven surface that made sanding more difficult. 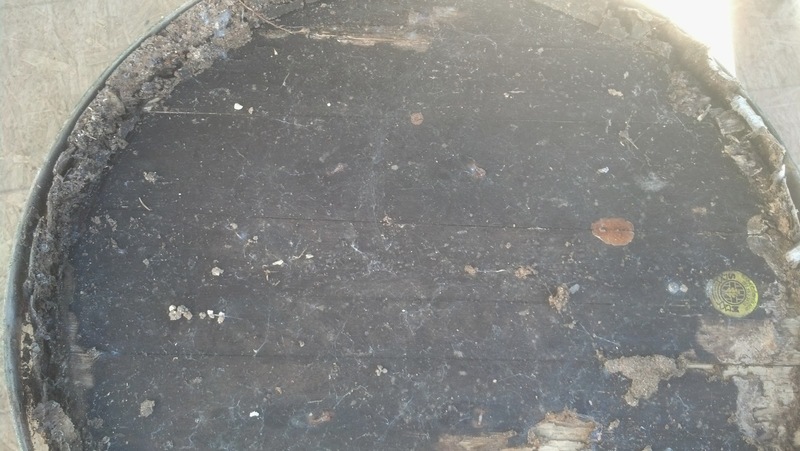 And note the rotten area at top filled in with new wood. Sometimes you receive a barrel that has already been worked on and might have paint or some other stain on them. Such was the case with this barrel. It had paint on the hoops (bands) and the wood had been stained. Subsequently, the next process was to strip the paint and stain off the barrel so we can have a decent surface to sand, restain in this case, seal and paint on both the hoops and the wood. The hoops took quite a bit of sanding on to strip off all the old paint. Note that the stain clogs up our sandpaper more than usual, bogging down the process; plus, sealer isn’t easy to sand off – it’s sticky. Additionally, the wood was harder than normal to sand because it was uneven because the deteriorated ends of the staves made it difficult to bring back to a flush surface. We prevailed for the most part but if the barrel wasn’t perfectly even, that was okay since it added character – common with any of these unique pieces – which the owner of the barrel was more than fine with. Next up after the sanding, will be prepping – a tedious chore – and then application of the stain and sealer. We will stain the wood surface with a darker than normal color, add sealer and then paint the hoop bands burgundy. Stay with us as we show you additional progress on this special order dealing with a very old and decrepit wine barrel. This entry was posted in Barrels + and tagged hoops, old wine barrels, staves, stripping stain, wine barrel on January 23, 2014 by PasoDr. Looks bad? It is and some of the ends of the staves are all but gone. Not all old wine barrels are created the same. Certainly that can be the case when barrels are left to rot. 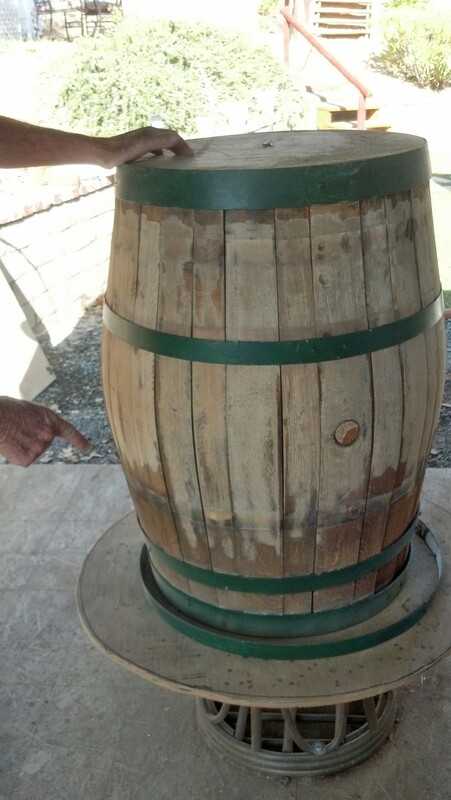 Such was the case with this wine barrel that the owner wanted renewed as one of our recrafted and renovated Decorative Wine Barrels. Still, not all old wine barrels are recraftable – did I just make up a word? This barrel was in the dirt for many years. A cap or head on one end of this barrel is rotten (from sitting in mud when it was wet) with almost nothing left of the ends of the staves to keep the head in the barrel. This barrel will have to have a top and bottom with this being the bottom. We will put an extra piece of wood to cover the cap. 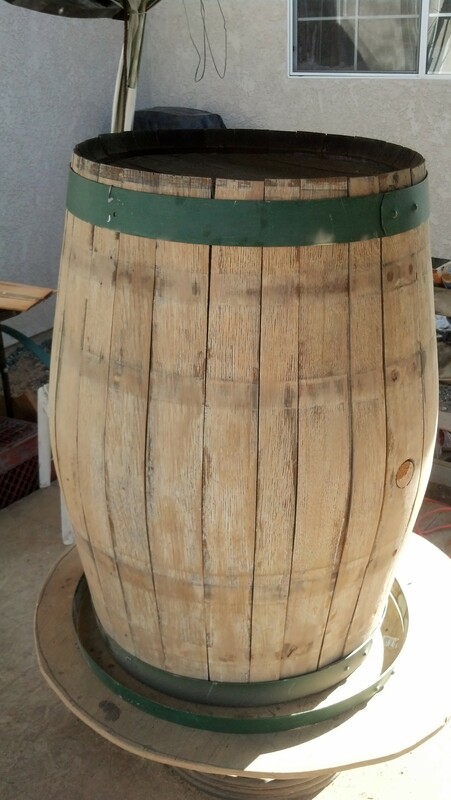 This is a special order we’re doing because the owner wanted this barrel. We will sand, seal, stain the one cap on this barrel with extra sealer so that it might last many more years sitting in the owner backyard. Also, this particular barrel will be coated with a special tint that we call leather, which gives off a much deeper and darker look to the barrel. You can see much of the beveled edge, which is called the chime, is essentially gone. Click on the pictures to get a blowup of what we’re talking about. Stay with us as we show you additional progress on this special assignment. This entry was posted in Barrels + and tagged chime, croze, head of barrel, old barrels, rotten barrels, staves, wine barrels on January 22, 2014 by PasoDr. Wine Barrel Bands: What Color Looks Best? As the story goes, we did these decorative wine barrels with the thought that it would match up with our trim around the house, so they became green – Hunter green to be specific. However, as time went on, we felt the burgundy look might be best as it matched up with the barrels color. Then when we saw black on some whiskey barrels, it added a distinctive look that set off the barrel. With that said, and along with the idea that we could just buff out the stainless steel bands and go with a more natural look, what do you feel looks the best? Possibly another color might be your favorite? Note: we’ve looked into chroming the bands, but the cost is quite high and for now, we won’t offer that as an option. Although feel free to vote that in as an alternative. You can vote once a week and let your friends in on the poll as well. Thanks. This entry was posted in Barrels +, Poll and tagged band colors, barrel bands, wine barrels on January 22, 2014 by PasoDr. When it comes to white oak, you can find them all over the United States though primarily in the eastern half of the country. 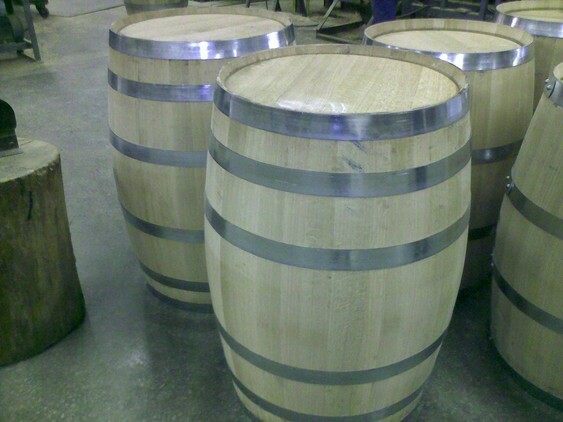 However, when it comes to where cooperages find American White Oak (quercus alba) for creating wine barrels, largely most of the wood derives from one region: Missouri. 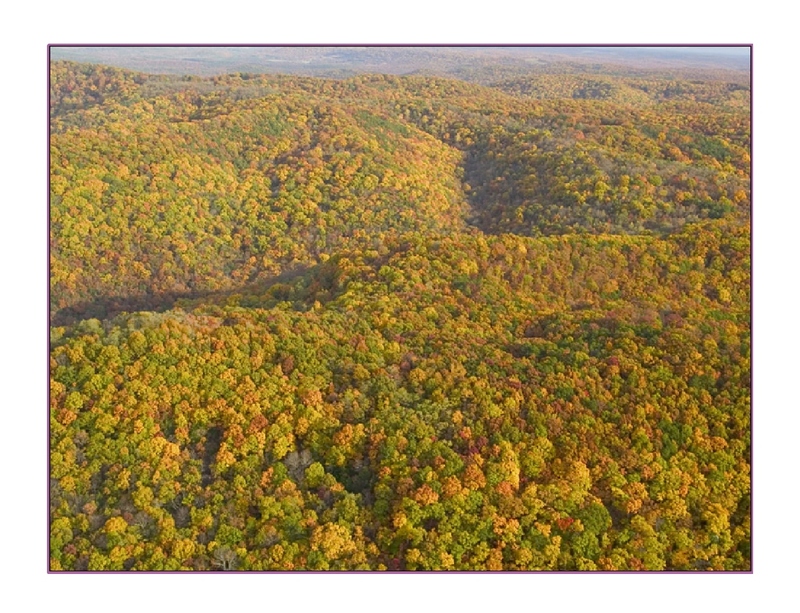 Ozarks are filled with numerous trees including a great deal of White Oaks. The vast majority of white oak comes from four regions of the U.S., and they are: Minnesota, Missouri, Pennsylvania, Virginia. There are other areas, such as Oregon and Northern California which produce some white oak for wine barrels, but again, the bulk of oak in America comes from these regions listed. Still, Missouri dominates the others with overall production. In fact, only France produces more wood for oak wine barrels than Missouri. American and French oak differ with the tightness of grain being a major distinction, which in-turn allows American barrels to give off more intricacies in flavor than French. American wine barrels tend to breath slightly more. Encasing wine, American White Oak gives off a touch of spicy vanilla with maybe dill. And there are nuances between the different sections of the U.S. (sources listed below). For instance, Virginia’s white oaks are not that unsimilar to French oak due to its tighter grains; and therefore are more subtle than their other American counterparts. Pennsylvania white oak offers a smoky background while Minnesota oaks are more astringent (caused by tannins) and maybe can create a more drier wine. In contrast, white oaks from Missouri give off a toasted and coconut taste. It should be noted that Missouri forests were always a major contributor for whiskey barrels over the many centuries, so when wine became a big business in America, the same cooperages and more began producing wine barrels. Over the years, cooperages and winemakers have figured out that the thick American oak barrels could be recoopered including retoasting. That adds value and life to the barrels so when combined with taking cues from the French, the quality of barrels coming out of the U.S. is as good as French barrels in some instances. Rings on an oak tell the age of a tree. Missouri white oaks typically take about 80 years to grow and another two years of aged drying once they’re made into a barrel. The southeastern half of Missouri is generally where you’ll find these nearly century old oaks – think Ozarks. By the way, this is also the population center of the U.S. For what it’s worth, the south central portion of the state is where you’ll typically find an abundance of slow growth white oaks making them the best for wine barrels. I might say, having family in this neck of the woods, I can attest to the abundance of these great trees. Some might say that Missouri white oaks are better than French – blasphemous to utter in some parts of the world. However, trees from this region of the Midwest grow in what is mostly poor soil laden with rocks making trees grow more slowly adding more growth rings and thus making the barrels breath better. The Missouri wine barrel business continues to grow and although Missouri and France may be worlds apart in more ways than most, regardless, they have one very important item comparable: white oak wine barrels. This entry was posted in Barrels + and tagged American White Oak, cooperage, Missouri Oak, oak wine barrels on January 20, 2014 by PasoDr.